Coffee expert Chris O’Brien of Coffee Cycle helped us put four of the top manual coffee grinders through the ringer. By testing for grinding performance, consistency, durability, ease-of-use and blind taste testing, we discovered the JavaPresse is the best manual coffee grinder for the home, camping or travel. The JavaPresse has a durable stainless steel build with a ceramic burr set, plus user-friendly features like a grind catcher window. We ranked the Porlex – JP-30 as our runner-up. In order to determine which grinders to test, we drew on the extensive research we did in our best electric grinders post. 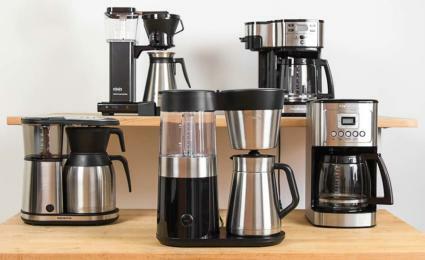 We were looking for a grinder that can create grinds consistent for either French press or pour over coffees, which are the most common at-home brewing methods. Consumers brewing those styles are looking for grind particles that are consistently medium to coarse with an equal number of larger and smaller grinds, and the majority in the middle. In the French press and pour over style of coffee brewing, a consistent grind releases flavors and exposes aromatics to the coffee drinker. On the other hand, an inconsistent grind can lead to off-flavors and bitterness because different ground sizes cause inconsistent release of flavors and aromatics. We used a Kruve Sifter to measure the grind particle size distribution and determine which grinders were consistently generating the desired grind particles. 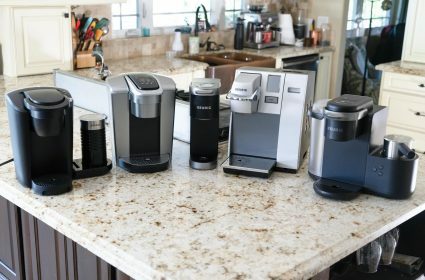 We read a wide array of user reviews from Amazon, Reddit and various coffee blogs to create a list of grinders to consider. 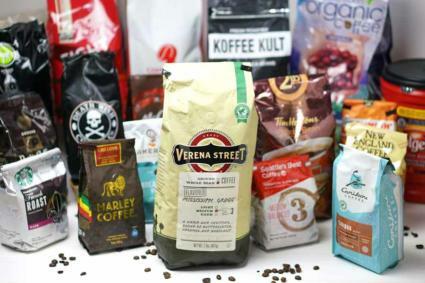 Then, we cross-referenced them with manual grinder reviews across the web, looking for brands and specific grinders that scored highly across a wide variety of sources. 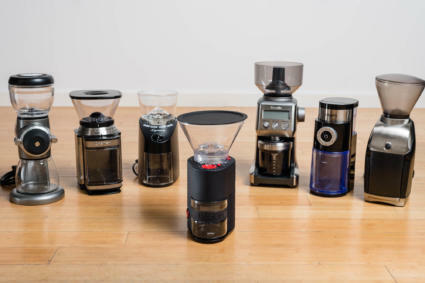 Ultimately, we chose four grinders to test: two that seemed primarily designed for countertop use and two that were sized more efficiently, making them more versatile for home or on-the-go use. We looked to determine if the size of the grinder impacted the quality of the grind. We also considered the user’s experience when grinding at home and while traveling. Durability was scrutinized more closely when considering if a grinder was suitable for use outside the home. For espresso drinkers, a consistent, fine grind is traditionally preferred. However, recent science has shown that a controlled mix of particle sizes is important for generating the subtle flavors an espresso can possess. So if espresso is what you’re after, you’ll want a grinder created specifically for that purpose. Although it is possible to make an espresso fine grind with a manual grinder, we excluded espresso as a brewing method to focus on the most common methods of coffee making. In addition to the grinders we tested, there were several notable hand grinders that we chose not to review, including multiple versions of the Lido line of grinders from Orphan Espresso and the Knock – Feldgrind manual grinder. These grinders are highly regarded and in some cases fairly hard to acquire, but since we chose $100 or less as a reasonable budget for the average consumer purchasing their first manual grinder, we decided to omit them. We considered a multitude of features on each grinder, including grind options, grind consistency and particle size distribution, user experience, cleanliness, durability, noise, size and aesthetic. Each of our grinders featured a conical ceramic burr set, eliminating the need to compare differing burr materials. Conical burr grinders consist of a cone-shaped burr that sits inside of a hollowed out burr that fits over it. Grinds are pulled vertically through the burrs. Grind options: Only the Handground Precision offered preset indicators for the style of grind they’re intended for. For example, an image of a French press brewer represents the recommended setting for making French press coffee. The remaining three grinders used some variation of a rotating nut that can be loosened or tightened for coarser or finer grinds. One detriment we found on these three was a tendency for the nut to loosen on its own depending on the vigor with which the user was grinding beans. All four allowed for variation between steps or offered a stepless rotation, allowing for micro adjustments for truly dialing in a grind profile. Size, style, materials and durability: We also considered each grinder’s size, if it was suitable for use while traveling and if the materials would withstand regular use over time. There was a noticeable divide between the smaller, travel-friendly grinders and the countertop-based grinders. The smaller ones were more durable with bodies made primarily of stainless steel. Both the Porlex and JavaPresse have stainless steel bodies and a removable arm, making them easier to use while traveling. All of the grinders had conical ceramic burr sets. However, the overall quality of a ceramic burr set is more accurately measured over time. High-quality burrs will stay sharp and require less maintenance as time goes on. Low-quality burrs may be sharp at first, but dull quickly, requiring sharpening or replacement. Sharp burrs grind more consistently than a dull grinder. The larger the grinder, the more beans it can hold in the hopper, reducing the need to fill and refill beans if making multiple cups. Noise and speed: How loud a grinder is, especially in the morning, matters a great deal! The manual grinders were all quieter than electric versions, but some unexpected noise issues occurred during use due to the instability of the countertop grinders. The Hario and Handground were top-heavy when filled with beans. During the testing process they were prone to tip and fall, causing a ruckus. It took between two and three minutes for each grinder to hand grind beans for one cup of coffee (27 grams). The larger grinders had an advantage: one rotation of the cranking arm created more grind than their smaller counterparts. They also held more beans. User experience: In our testing, we considered how easy it was to set up and adjust each grinder, and its functionality of use. Some grinders were unsteady when the crank arm was rotating, and some were unnecessarily difficult to calibrate. The minimalist JavaPresse – Manual Grinder and Porlex – JP-30 have a simple up and down design with easy-to-remove burr sets, which makes for minimal mess and easy cleanup. 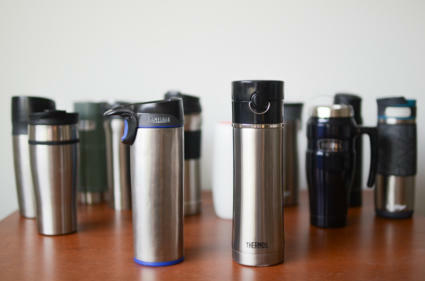 We tested each grinder for grind quality, and conducted blind taste tests with both French press and pour over coffee. We did our testing at the Coffee Cycle coffee shop in an effort to keep our methods consistent with our previous electric grinder testing. Proprietor Chris O’Brien provided a high level of expertise in all facets of coffee in case we faced difficulties. In order to keep our testing consistent, all of our grind particle size and distribution tests were done from one batch, as was all of our brewed coffee in the taste test. Chris provided us with El Salvadorian coffee beans from the awarding-winning Bird Rock Roasters for our testing. French press grinds should be between 600 and 1,000 microns in size. For pour over coffees, the ideal grind is between 400 and 800 microns. To achieve the ideal flavor extraction, the majority of grinds should be consistently sized. Grind size distribution should be a bell curve with a small but equal number of finer and larger grind particles complementing the majority of beans in the middle of the size distribution. We set up Kruve Sifter’s three-tiered receptacle system with sifters of 600 and 1,000 microns for our first grinding test. That range showed a grind that was ideal for French press, our coarsest desired grind. We set each grinder on the finest setting as our starting point. This process made it easy to identify grinders that created a lot of boulders (large particles) or extra fines (very small particles). “Usable settings” are not something you can typically determine before buying a manual coffee grinder. Manufacturers imply that all the settings are usable, but our previous testing on electric grinders and our testing on manual grinders proved otherwise. Usable grind size settings are more important than total settings because any options outside the desired range for French press or pour over coffees are not beneficial for coffee brewing. We ran an equal weight of beans through each grinder multiple times to do a basic level calibration of the machine, making sure the grinder was assembled correctly, and working properly. All the beans were ground from the same batch. Then, we measured the grinds with the Kruve Sifter to determine if each grinder would consistently achieve the desired results over multiple uses. Only the JavaPresse and Porlex achieved grinds fine enough and with an even enough distribution to make a quality French press or pour over coffee. All of the grinders we tested were fairly easy to set up and use out of the box. The Hario – Skerton was the most difficult to adjust. 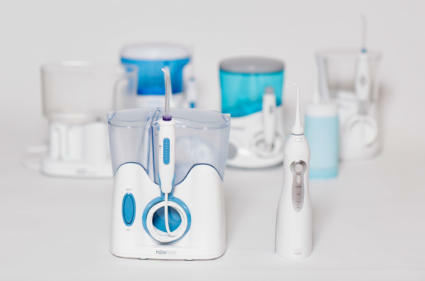 It has a unique grind adjustment mechanism that required you to unscrew and remove the crank arm, then disconnect an interlocking nut and stopper system in order to adjust the grind setting. The silicone grip base did not stabilize well, which made it more difficult to grind. The Handground – Precision manual grinder came with additional washers to calibrate the burr set; however, the process was complicated, messy and ultimately not beneficial. We all performed our taste test using a traditional cupping method, looking for body, acidity and flavor. Traditional coffee cupping involves filling a cupping spoon ¾ full with coffee. To taste, you tip and slurp the coffee aggressively in order to aerate the coffee flavors and spread them across your palate. This process cools the liquid, minimizing temperature differences that may impact the flavor profile of the coffee. We gathered a random sampling of tasters with varying coffee experience to taste the coffee made with our grinders. We ground multiple sets of beans with each grinder, and brewed a French press and pour over cup from each. Each cup in the taste test used beans ground at the optimal settings based on our prior testing, and was brewed with 27.5 grams of coffee to 400 milliliters of water. Then, we ranked each cup from best to worst in the categories of French press and pour over. We aggregated the rankings from each taster to create a combined score for each grinder in both styles. The JavaPresse won our tasting for French press, and the Porlex won for pour over style. The Hario Skerton took third in both categories and the Handground fourth. The JavaPresse – Manual Grinder was our clear winner. It was the best overall grinder for both at-home manual coffee grinding, as well as the best for on-the-go grinding needs. The JavaPresse claims 15 settings, but stepless micro-adjustments offer lots of opportunity to achieve the grind profile desired for both pour over and French press. The JavaPresse is small, compact and extremely easy to assemble, adjust and use. To use, you remove the cap at the top to put your beans in the hopper, replace it, fit the crank arm and turn the arm to grind the beans. 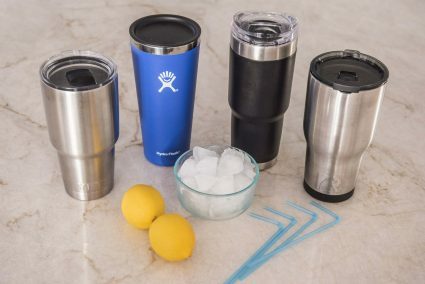 It only holds enough beans for one 12 ounce cup of coffee, but makes up for it with a durable stainless steel body and high-quality conical, ceramic burr set. Adjusting settings merely requires sliding the grind catcher off the body of the grinder and rotating the nut that adjusts the settings from fine to coarse. The JavaPresse combines a durable stainless steel body with a quality ceramic burr to create consistent grind profiles excellent for both French press and pour-ver coffee — and all at a consumer-friendly price. It also won 1st place in our French press blind taste test. The body itself is very stable and fits together well. Each part complements the other parts. During the grind effort, the body and bean hopper remain tightly connected. A tall, narrow slot window allows you to see grinds building up, adding confidence that all your hard work is effective. Its small size and removable crank arm allows for easy storage and transport. It is small and light enough to comfortably fit in a purse, briefcase or backpack. 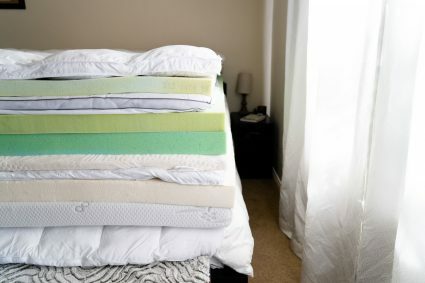 Its vertical packing shape also prevents it from becoming unwieldy. During testing, we started with the finest grind setting and got a good distribution of grinds falling within the 400-800 micron range, but none below the 400 micron mark. That range is just right for a pour over. With some minor adjustments, the grinds would come out in the 600-1,000 micron range with a perfect bell curve of size distribution. The majority of grinds were in the middle of the desired range with some finer and larger grind particles. Despite the small stature, the JavaPresse was the most effective at creating grinds that fell within our desired ranges for French press and pour over coffee. On drawback we found is that you cannot see into the bean hopper to see if you’ve ground all of your beans. This is true of the Porlex – JP-30 as well. It seems to be a sacrifice of size and durable stainless steel body. You have to do it by feel, or by taking off the crank arm and cap to look. With only gravity pulling the beans down on a smaller burr set, it takes almost three minutes grind a cup of coffee for a set of beans. The Porlex handle on the crank is too small and can be frustrating after awhile. You have the ability to make micro adjustments, but it is hard to tell if you’re on the same setting each time if you ever change it. You could mark it with a sharpie to make sure that it stays in place. However, it is the most economically priced grinder we tested. According to the JavaPresse website, the company donates to a cause for every purchase or “action” a member of the community makes. There is no description of what constitutes an action or how much is donated, but they are currently supporting the Make-a-Wish foundation of Central and South Texas. In a blind taste test, the JavaPresse made the best tasting French press-style coffee, and took second place for pour over. Micro-adjustments between presets enable precise calibration. 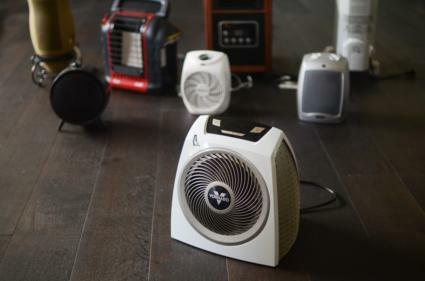 It has a durable, anti-static stainless steel with a ceramic burr set. It was designed for function and form with a small footprint, making it easy to travel with. At first glance the Porlex – JP-30 could be a twin to the JavaPresse, but it really doesn’t have the same caliber of quality. The Porlex’s fit between top section containing the burr set and hopper and the lower grind catcher is looser, so you need to make sure you hold it firmly in the middle or it will pull apart during use. It has the same durable stainless steel body, and the crank arm is a bit longer, helping generate a bit more leverage to speed up the grinder. The knob on the crank arm is also bigger and a little more ergonomically pleasing. The Porlex was a close second, taking the top spot in our blind pour-over taste test. The Porlex company also has a long tradition of making quality ceramic burrs. Internally, the parts feel cheaper. There is more of a mess and static around the base of the burr set, which causes grinds to cling to the burr set instead of falling into the grind catcher (which you cannot see because there is no window on the grinder catcher). At the finest grind settings, a majority of the grind falls in the desired range of 600-1,000. It tended toward too coarse of a grind for even French press during the first round testing, but became more consistent as we used it. By the time we taste tested, we could get grinds fine enough for pour overs, but it wasn’t consistent. One grind would create a perfect distribution of grinds for pour over and the next wouldn’t be good enough for French press, even though we did not change any of the adjustments on the grind. Despite issues with consistency and quality control for fitting of the parts, the Porlex was still a useable grinder. 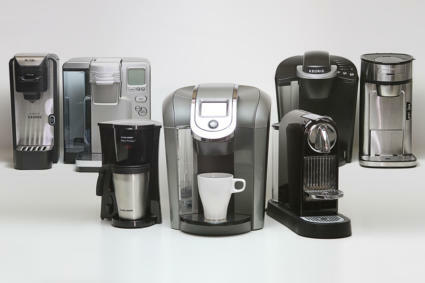 However, it has a much higher price-point and felt underwhelming compared to the JavaPresse. It was functionally much better than our other finalists, the Hario and Handground, making it our second place finisher. In a blind taste test, the Porlex – JP-30 made the best tasting coffee for pour over coffee, and took second place for French press. Micro-adjustments between presets enable plenty of grind profile calibration. 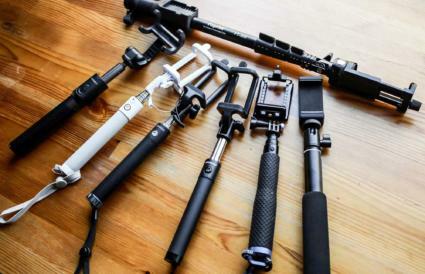 It is small and easy to travel with. 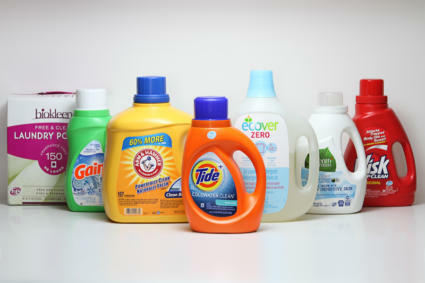 Porlex is an established brand with a history of quality products. Our other two competitors were both more suited toward the kitchen counter than on-the-go. The largest in size by a significant margin, the Handground – Precision Grinder looks cool and feels sturdy. It comes with a sticky base meant to help with stability, and a side-mounted crank arm to generate leverage. The anti-static glass hopper and bean catcher prevent grinds from clinging to the side, and it can hold three to four cups worth of beans to be ground in the hopper. The hopper and catcher are glass, so you can see when your grind is done, and it comes with washer for calibrating the burr set more finely. For each positive feature of the Handground, there was a negative. The Handground was very hard to keep stable during the grinding process. The extra leverage afforded by the side mount crank arm also caused it to tilt and wobble, even if you were using your opposite hand as a stabilizer. It worked best when we were standing, putting downward pressure on top of the grinder. Our first attempts to grind beans resulted in a grind profile much too coarse for a French press. In order to calibrate for a finer grind, we needed to pull apart the entire apparatus which includes three screws undone with an allen wrench (provided), two rotating outer pieces, the burr assembly including inner and outer, the hopper, rotating preset arms and the springs and washers already in there. The entire inside is coated with industrial lubricant, so be prepared for a mess on your hands. And you definitely want to wash the machine thoroughly afterwards. After spending 15 minutes trying to get everything to line up again, we finally reassembled the Handground Precision Grinder. We added both washers in hopes of creating a much finer grind capable of producing a pour over coffee, but we were disappointed. Originally, a majority of the beans were ground to boulders over 1000m with a significantly lesser amount caught below 1000m, and a minority of grinds at finer than 600m in the bottom of the sifter. After adding the washers to create a raised burr set and setting the grinder to the finest setting more than half the total grinds were still boulders above 1000m. A quarter of the grinds fell in between our desired range of 600-1,000, and the remainder were fines and extreme fines. That meant the Handground was incapable of making grinds in our desired range for either pour over or French press during our testing. There was no consistency to this grinder. It has a beautiful aesthetic, but the function and quality of grind fails to impress. We also considered that we made a mistake in the reassembly of the grinder, but the complicated grind system would have still negatively impacted our ranking of the grinder significantly. Finally, the Handground was the unanimous last place finisher in our blind taste testing for both French press and pour over style of coffee. That is a hard blow to come back from. This grinder fails to impress. It feels like the functionality of the grinder was an afterthought to the aesthetic. The Hario – Skerton is a servicable coffee grinder. It feels like a bland version of the Handground, though it is more effective. It does allow for micro adjustments, but it is more complicated than the other grinders to adjust, and is not very intuitive. The ceramic burr set seems like it is of a decent quality, but most of the other parts feel cheap. It has a plastic hopper and glass bowl bean catcher that is heatproof, but not anti-static. One grind and there was already a mess of grinds stuck to the interior chamber. The curvature of the base looks good, but also catches grinds at the lip making it more difficult to disperse them. The cap is a soft anti-slip silicone cover that will slip off with a minor bump. There is an anti-slip silicone cover on for the base that isn’t fitted and collects dirt and dust. It fell off multiple times during testing. It is in-between the Handground and JavaPresse in size, but still big enough to be inconvenient to travel with. Its dumbbell shape makes it a little wobbly, but because it is shorter in stature it doesn’t tip as much as the Handground. At the finest possible grind setting, the majority of grinds falls above 1000m with a quarter each in the desired range and too fine. The grind fails to meet even the coarsest options for a French press. It placed third in our taste test, and failed to leave an impression. The JavaPresse consistently created the right grind profiles to make great tasting cups of French press and pour over coffee. It has a user-friendly design that is easy to use, and it’s easy to travel with and extremely durable. Plus, it’s the best price. It was easy to choose the JavaPresse as the best manual grinder to buy for at home or on the go. The Porlex – JP-30 would be your alternative choice if you’re looking for a similar product from an established company. The consistency of grinds seemed to improved with continued use, and it has a durable finish. Ultimately neither the Hario nor the Handground were able to produce the desired grinds with any consistency, making them impossible for us to recommend. Its compact stainless steel body and quality ceramic burrs are perfect for French press and pour over coffee when you're on the go.